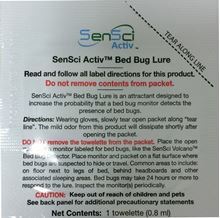 SenSci Active Bed Bug Lures are very effective. The active ingredient imitates the chemicals on the surface of human skin making this a highly effective product. Easy to use, just tear the packet open and put it in the monitor. DO NOT remove the contents of the packet.